RAF Group Captain Tony Innes, Commander Bastion and Commanding Officer 903 Expeditionary Air Wing. Garrison of 5,000–12,000 troops. Could hold over 28,000/ 32,000 troops. An ambulance waits to receive a casualty from a Chinook on the helipad. Camp Shorabak (formerly Camp Bastion) is a former British Army airbase, located northwest of the city of Lashkar Gah in Helmand Province, Afghanistan, until 27 October 2014 when the British Army handed over control to the Afghan Ministry of Defense. The base has barracks for the Afghan National Army. Between 2005 and October 2014 it was the logistics hub for International Security Assistance Force (ISAF) operations in Helmand during the War in Afghanistan and Operation Herrick, and it was capable of accommodating over 32,000 people. The camp was built by the British Army and was the largest British overseas military camp built since the Second World War. The base was also home to troops from a number of nations, including the United States and Denmark. 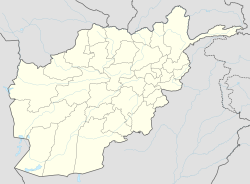 Shorabak contains the Afghan National Army (ANA) camp (also called Camp Shorabak), and also held Camp Leatherneck until 2014. In November 2006, the then British Prime Minister Tony Blair visited Camp Bastion, and, while addressing a gathering of British troops, described it as an "extraordinary piece of desert ... where the fate of world security in the early 21st century is going to be decided". Camp Shorabak began life as Camp Bastion, a Tactical Landing Zone set up by two Air Traffic Controllers from the Royal Air Force's Tactical Air Traffic Control Unit. This provided a vital and strategic insertion point in Helmand Province and unbeknownst to the two controllers, was to be the foundations for Camp Shorabak. The camp started out with just a few tents in 2005. However, from early 2006 personnel from 39 Engineer Regiment Royal Engineers and various contracting firms, all under the supervision of 62 Works Group Royal Engineers started to build the base with more robust facilities, the camp was situated in a remote desert area, far from population centres. Four miles long by two miles wide, it had a busy airfield and a field hospital and originally had full accommodation for the 2000 men and women. The base was originally named by the Commanding Officer of 62 Works Group (RE) based upon the unit's emblem of a lone Bastion; Hesco Bastion. The first camp to be built was Camp 251 which housed the construction force and they were housed in tents. The first runway capable of landing C-17's direct from the United Kingdom opened in Camp Bastion on 3 December 2007. The base had previously been divided into a number of different sections (bastions). Bastions 1 and 2 were the first, with Bastion 2 containing Camp Barber (US) and Camp Viking (DK). Bastion 0 was added in around 2010 and housed the contractors and Bastion 3 was used for in-theatre training. Camp Bastion included Bastion Airfield, Bastion Garrison and Camp Leatherneck. As of September 2014 it was reported that both Bastion 2 & 3 have been reverted to desert. Camp Bastion airfield and heliport handled up to 600 fixed- and rotary-wing aircraft movements every day in 2011, operating combat, medical and logistics flights. Its air traffic controllers were integral to the support of the UK's operations in southern Afghanistan and the Air Traffic Control Squadron at Camp Bastion was the first to recruit and train US Marines to UK air traffic control standards. In February 2014, snow fell in Camp Bastion for the first time since the base was established, eight years earlier. The camp was handed over to the control of the Afghan security forces on 26 October 2014. On 27 November 2014, insurgents infiltrated Camp Bastion. As of Sunday 30 November, the Afghan National Army had not fully driven out the "Taliban" fighters. At least five ANA soldiers were killed in the attack. Upon completion of British and US military withdrawal from Camp Bastion, it was renamed Camp Shorabak as this was the name of the Afghan base situated there. In December 2015, it was announced that a small contingency of British troops would return to Camp Shorabak in an advisory role, due to the Taliban overrun of Sangin district in Helmand province. The base was initially home to the Afghan National Army and during Operation Herrick 7 2nd Battalion, the Yorkshire Regiment's Battlegroup HQ. The main user of the camp was the United Kingdom which based a number of rotary and a few fixed-wing aircraft. During June 2011 a brand new air traffic control tower was opened which was built by 170 Engineer Group. The main aviation unit was No. 903 Expeditionary Air Wing which was responsible for the operation of the airfield and operated the Raytheon Sentinel R1 - Airborne Stand-Off Radar (ASTOR) along with Westland Sea Kings ASACs and Thales Watchkeepers. Joint Helicopter Force (Afghanistan) operated AgustaWestland Apaches, Westland Lynx, Westland Sea Kings, Boeing Chinooks of No. 1310 Flight RAF and AgustaWestland Merlins of No. 1419 Flight RAF. Both RAF Flights performed troop and cargo moves but the Chinook also carried the Medical Emergency Response Team (MERT) and Incident Response Teams (IRT). Crew Training School (for vehicles). Theatre Military Working Dogs Support Unit. The base was protected by the Bastion Force Protection Wing as part of the multi-national Task Force Belleau Wood. During August 2013 the Headquarters of Task Force Helmand moved from Lashkar Gah to Bastion. In 2013, a training school for Afghan troops was opened. By March 2014, the population of the camp had reduced to 4,000 UK service personnel, as preparations were well-underway for UK military withdrawal from Helmand in October 2014. During the dismantling of the base the scrap metal was taken away by ProCon Building Materials Trading LLC. The United States Military used part of Bastion Airfield for their aircraft and they had their own camp within Camp Bastion until 26 October 2014. Marine Light Attack Helicopter Squadron 467 (HMLA-467) which operated Bell AH-1W SuperCobras and Bell UH-1Y Venoms. Marine Wing Support Squadron 274 (MWSS-274) from 7 April 2014. Marine Wing Suppprt Squadron-371(February 2009-October) laid aluminum matting in Camp Bastion and throughout Helmand Province. On 14 September 2012 Camp Bastion was attacked by a unit of 15 Taliban fighters. The base was defended by pilots and aircraft maintenance personnel from VMA-211Marine Attack Squadron 21]] and No. 51 Squadron RAF Regiment. Base security had been reduced in the weeks leading up to the attack, and the Taliban unit was able to damage or destroy eight USMC AV-8B Harrier II jets before all were killed or captured.Two Marines died in the fighting. It was the first time that Marine air units had fought as infantry since the Battle of Wake Island in World War II. Camp Shorabak has been used by various countries including Denmark (until 20 May 2014), Estonia (until 9 May 2014) and Tonga (until 28 April 2014). Camp Bastion's Hospital was built by 170 Engineer Group and was operated by regular and reserve personnel of the British Army, Royal Navy, and Royal Air Force of the Joint Force Medical Group, as well as medical assets from the US Army. Medical staff included Orthopaedic Surgeons, General Surgeons, Anaesthetists, Nurses and Medics. The hospital was the location to which wounded military personnel from the British, US and other ISAF forces in Helmand Province were evacuated from the battlefield for treatment, supported by US Army, Navy, and Air Force medics, or from which they were further evacuated to the Royal Centre for Defence Medicine at Queen Elizabeth Hospital in Birmingham. Afghan nationals were also treated at the hospital in many circumstances including accidental injuries and road traffic collisions. The hospital was closed down on 22 September 2014. The base has been attacked several times including on 14 September 2012, when two United States Marine Corps (USMC) service personnel were killed and six USMC McDonnell Douglas AV-8B Harrier IIs were destroyed and two were "significantly damaged." Three refuelling stations were also destroyed, with six soft-skin aircraft hangars damaged. Of the 15 Taliban attackers, 14 were killed and 1 captured. In May 2013 the BBC obtained documents showing that up to 85 Afghan nationals were being detained at Camp Shorabak. Philip Hammond, the defence secretary, has confirmed that the UK is holding "80 or 90 Afghan detainees" at the base. The Ministry of Defence maintains the detention of the Afghans is legal. On March 1 2019, Taliban suicide bombers and gunmen made an early morning attack on Afghan forces at Camp Shorabak, killing and wounding dozens just following another round of talks between U.S. and Taliban negotiators. According to an American military spokesman, U.S. Marine advisers (who suffered no casualties) helped Afghan troops repel the attack. Group Captain Tony Innes (January 2013 - 2014). Camp Shorabak has been featured in several documentaries, often focusing on medical evacuations. The Air Hospital (Channel 4) - aired 25 March 2010. Frontline Medicine (BBC 2) - aired 20 and 27 November 2011. Prince Harry: Frontline Afghanistan (BBC Three) - aired 28 January 2013. Gary Barlow: Journey to Afghanistan (ITV) - aired 23 December 2013. Top Gear (BBC2) - aired 9 February 2014. The Billion Pound Base: Dismantling Camp Bastion (Channel 4) - aired 7 December 2014. The One Show - Afghanistan: Coming Home (BBC1) - Series of films on redeployment of 2RTR soldiers and equipment from Camp Bastion. Filmed in September/November 2013. Narrated by Dan Snow and Tony Livesey. - aired January 2014. ^ "Change Of Command For CO 903 EAW At Camp Bastion". Royal Air Force (RAF). 4 February 2013. Archived from the original on February 7, 2013. Retrieved 7 February 2013. ^ LandWarfareCentre 2015, p. 30. ^ a b 4, Channel. "Dismantling Camp Bastion". ^ a b c "Camp Bastion doubles in size". MoD (UK). 18 May 2010. Retrieved 14 September 2012. ^ a b "UK base in Afghanistan handed over". BBC News Online. 26 October 2014. Retrieved 26 October 2014. ^ a b c "Bye-bye Bastion". Ministry of Defence (MoD (UK)). Retrieved 27 October 2014. ^ "Commander Bastion takes charge of UK's main Helmand base and its airfield". MoD (UK). 18 October 2010. Retrieved 14 September 2012. ^ Patrick Wintour (21 November 2006). "Bleak Camp Bastion - and a vision of roses and saffron". The Guardian. Retrieved 25 September 2007. ^ Raymond Whitaker (3 December 2006). "Camp Bastion: Welcome to Helmand". The Independent. Retrieved 25 September 2007. ^ "Inside Camp Bastion". www.theguardian.com. Guardian news. Retrieved 3 October 2014. ^ a b c "How to Close Camp Bastion". Forces TV. Retrieved 20 September 2014. ^ March 2008, p. 7. ^ "903 Expeditionary Air Wing". RAF. Retrieved 1 October 2013. ^ "IN PICTURES: New runway takes shape at Camp Bastion". MoD (UK). 27 July 2007. Archived from the original on 3 May 2010. Retrieved 1 June 2011. ^ "It's the snow soldier! Troops in Afghanistan build snowman as snow falls at Camp Bastion for the first time in eight years". Daily Mail. 17 March 2014. Retrieved 8 August 2014. ^ a b Drwiega, Andrew. "Combat Operations Cease from Camp Bastion-Leatherneck" Aviation Today, 28 October 2014. Accessed: 29 October 2014. ^ "Taliban Overrun an Afghan Army Base". New York Times. Retrieved 24 July 2016. ^ "Afghanistan Taliban: British military deployed to Helmand". BBC News. Retrieved 2015-12-23. ^ a b Grey 2010, p. IX. ^ "New control tower for Bastion Airfield". MoD (UK). Retrieved 28 February 2014. ^ a b "Beeston army engineers in homecoming parade". BBC News Online. Retrieved 5 December 2014. ^ "903 Expeditionary Air Wing". RAF. Archived from the original on 2015-03-18. Retrieved 11 March 2013. ^ "903 EAW 5(AC) Sqn - ASTOR". RAF. Retrieved 4 December 2013. ^ "Handover of UK headquarters team in Afghanistan". MoD (UK). Retrieved 2 December 2013. ^ a b "RAF Chinooks continue operations In Afghanistan - Tactical and Strategic Aeromedical Evacuation". Boeing. Retrieved 19 September 2012. ^ "RAF protecting Camp Bastion". MoD (UK). 25 June 2012. Retrieved 17 September 2012. ^ "British headquarters in Afghanistan moves to Camp Bastion". BBC News Online. Retrieved 1 October 2013. ^ "Afghan Army trained by British troops". The Daily Star. Manchester, UK. 12 October 2013. ^ "Saying goodbye to Camp Bastion". BBC News Online. 17 March 2014. Retrieved 8 August 2014. ^ "FoI Request" (PDF). MoD. Retrieved 27 October 2015. ^ "Marine Wing Support Squadron 372 transfers authority to MWSS-274 as last wing support unit in Afghanistan". DVIDS. Retrieved 30 June 2014. ^ "Forces medics bid farewell to Bastion". MoD (UK). Retrieved 29 October 2014. ^ Southby-Tailyour 2010, p. 5. ^ "US marines killed in Afghan attack on Camp Bastion". British Broadcasting Corporation. 15 September 2012. Retrieved 16 September 2012. ^ "ISAF provides additional details on Camp Bastion attack". International Security Assistance Force (ISAF). 16 September 2012. Archived from the original on 19 September 2012. Retrieved 17 September 2012. ^ Casciani, Dominic; Coleman, Clive (29 May 2013). "Afghans 'unlawfully held' by UK forces at Camp Bastion". London: BBC News Online. Retrieved 29 May 2013. ^ a b "Afghans 'Detained Illegally' At Camp Bastion, Lawyers Claim". The Huffington Post. 29 May 2013. Retrieved 29 May 2013. ^ Nelson, Craig. "Taliban Attack Afghan Army Base During Lull in Peace Talks, Deadly clash shows violence isn't abating despite negotiations to end 17-year war". Wall Street Journal. Retrieved 2019-03-02. ^ Snow, Shawn. "Taliban fighters try to storm base in Helmand province housing US Marines and Afghan forces". Marine Corps Times. Retrieved 2019-03-02. ^ "RAF Boulmer station boss lands top role in Afghanistan". Northumberland Gazette. Retrieved 27 March 2017. ^ "New Commander Bastion". RAF. Retrieved 27 March 2017. ^ "The Air Hospital". Channel 4. 25 March 2010. Retrieved 18 September 2012. ^ "TV programme showcases military medics' work in Helmand". MoD (UK). 18 November 2011. Retrieved 19 September 2012. ^ "Extraordinary Dogs". Documentary Channel. Archived from the original on November 12, 2011. Retrieved 19 September 2012. ^ "Prince Harry: Frontline Afghanistan". BBC Three. Retrieved 11 March 2013. ^ "Gary Barlow: Journey To Afghanistan". 23 December 2013. Retrieved 8 August 2014. ^ "What's in store this week on Top Gear?". BBC - Top Gear. Retrieved 9 February 2014. ^ "The Billion Pound Base: Dismantling Camp Bastion". Channel 4. Retrieved 7 December 2014. Grey, S (2010). Operation Snakebite. UK: Penguin Books. ISBN 978-0-141-03830-8. LandWarfareCentre, AD (2015). Operation Herrick Campaign Study. Land Warfare Centre, Warminster, Wiltshire, UK: MoD. March, P (2008). The Royal Air Force Yearbook 2008. Fairford, UK: The Royal Air Force Charitable Trust Enterprises. Southby-Tailyour, E (2010). 3 Commando Brigade - Helmand Assault. UK: Ebury Press. ISBN 978-0-09193-776-8. Wikimedia Commons has media related to Camp Shorabak. 24 September 2012 BBC News, "Inside Camp Bastion"